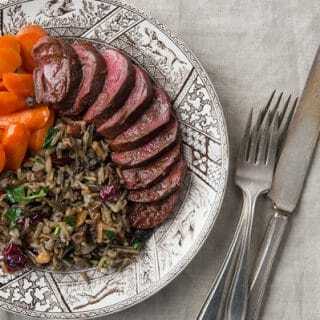 Wild rice and duck is a classic combination, at least in the Upper Midwest, and it’s one of the easiest places to apply the “if it grows together it goes together” mantra I try to live by when I create dishes. After all, wild rice grows in the marsh. Ducks live in the marsh. There ya go. A few days ago I greeted the dawn nestled into some cattails on the bank of a small lake near Stillwater, Minnesota. My friends Chris Niskanen and David Orrick were by my side. This was Chris’ home lake — his house was just yards behind us. It was also the site where the first wild duck I ever ate was shot: A fat drake mallard that Chris handed me one day at work back in 2002. It was a typical October bluebird day, with no wind and bright, clear skies. We were waiting for a flock of geese to show up, as they do every morning. A side bonus would be if some wood ducks would swing into range. We could hear their eerie whistle elsewhere on the lake as the dawn opened. A hen wood duck soon surprised us by dropping into the pond right in front of us. I’d set out a lone decoy, a drake shoveler hand carved by my friend Brian in Michigan. In the low light, the hen must have mistaken the gaudy plumage of Mr. Spoonie for that of the nearly equally gaudy feathers of a drake woodie. The hen was on Chris’ side. “Hen woodie. Right there!” I hissed. Chris was just a shade too slow, however, as the duck swam away before he could stand and flush it within realistic shotgun range. Bummer. Then we heard them. The Canada geese were honking to each other somewhere in the air behind us, coming this way. “Don’t move,” Chris said. I didn’t. I kept the brim of my hat down as I heard the geese sail closer and closer. They had to be right above us. Then my heart sank. The geese honked again, farther away. Then farther still. Damn. Something spooked them. Maybe they saw us. Who knows? Hunt over, I climbed back into my little truck and headed down the highway to Madison, Wisconsin, where I went to graduate school almost 20 years ago. Along the way I passed many marshes, some with stands of wild rice, which had long since fallen from the stalks. Real wild rice — hand harvested and hand parched — is an amazing food. It cooks quickly, in just about 20 minutes, and has a smoky, earthy flavor far more interesting than the cultivated variety largely grown in California. It can be hard to find outside Minnesota, Wisconsin and Michigan, but you can buy real wild rice online. 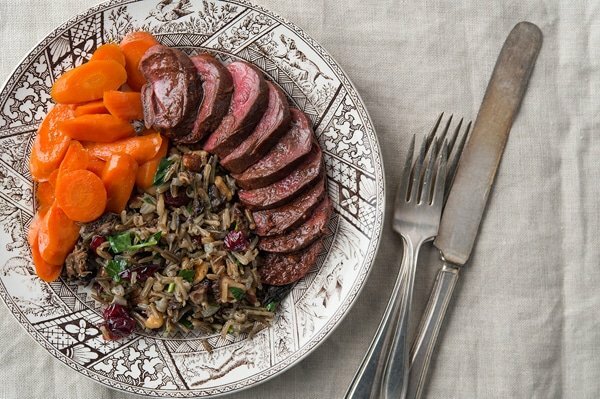 This recipe is just a simple rendition of the classic: Duck breast with wild rice pilaf. I added two other Northern ingredients to the pilaf, dried cranberries and toasted black walnuts — both of which are all over the place in Minnesota and Wisconsin. 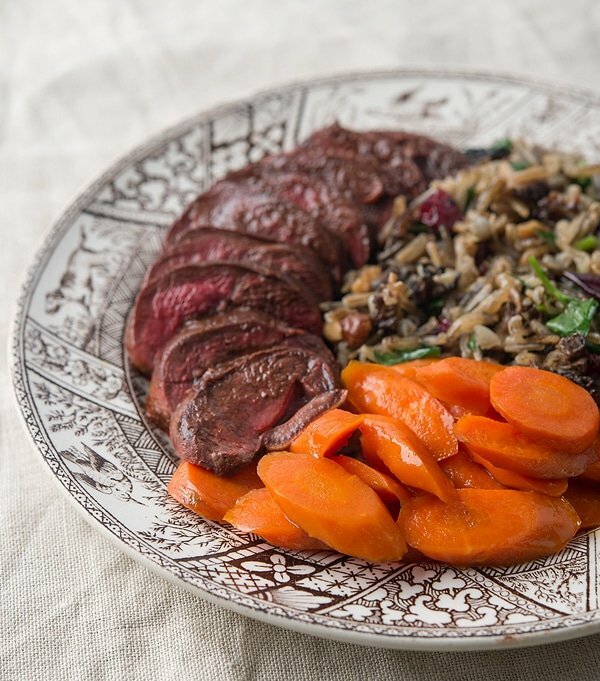 Serve it with a simple glazed carrots recipe I worked on with Elise Bauer of Simply Recipes. Enjoy it as you enjoy the falling leaves and cooling weather. This is really a simple recipe. I have some semi-esoteric ingredients in here, like black walnuts and squash seed oil, but you can easily substitute regular walnuts and something like sunflower oil or walnut oil. I also splash a little bit of pontack on the duck, which is a complex elderberry sauce; balsamic vinegar is a good substitute. The wild rice pilaf is just as good at room temperature, so you can make is ahead of time, and eat leftovers for lunch the next day. Take the duck breasts out of the fridge and salt them well. Set aside for now. Soak the dried mushrooms in the hot water and set aside for 20 minutes. When the mushrooms are soft enough, chop them well. Strain the soaking water through a paper towel that has been set inside a sieve. Save the water for cooking the rice. Heat the duck fat for the rice in a saucepan over medium-high heat. Saute the onions until they are just beginning to brown on the edges, about 5 minutes. Add the mushrooms and rice and saute another minute or two. Add the dried cranberries, then the stock and 1 cup of the soaking water. Add salt to taste. Bring to a simmer, cover and cook until the rice is cooked, about 20 minutes. You might need to drain the rice; different rices soak up different amounts of liquid while cooking. Drain and move to a large bowl. Add the walnuts and parsley and salt and pepper to taste. Drizzle the oil over the pilaf and mix well. Pat the duck breasts dry with paper towels. Put the remaining duck fat into a large frying pan. If your ducks are fat, turn the heat to medium-high and lay the duck breasts in the pan as soon as the fat melts. If your ducks are skinny, wait until the pan is hot before putting in the duck breasts. Cook the duck breasts skin side down at a steady sizzle (think about how bacon sounds when it's cooking and you have the idea), until the skin has browned nicely, about 5 to 8 minutes. Turn the breasts and cook on the meat side for 2 to 4 minutes, using the finger test for doneness to determine; you are looking for medium-rare. Take the duck breasts out and grind black pepper over them. Let them rest for 5 to 8 minutes before slicing. Drizzle some pontack or balsamic vinegar over them before serving with the rice and a vegetable of your choice. Ailsa: Just sear it like a steak if the breast has no skin. No bacon needed.